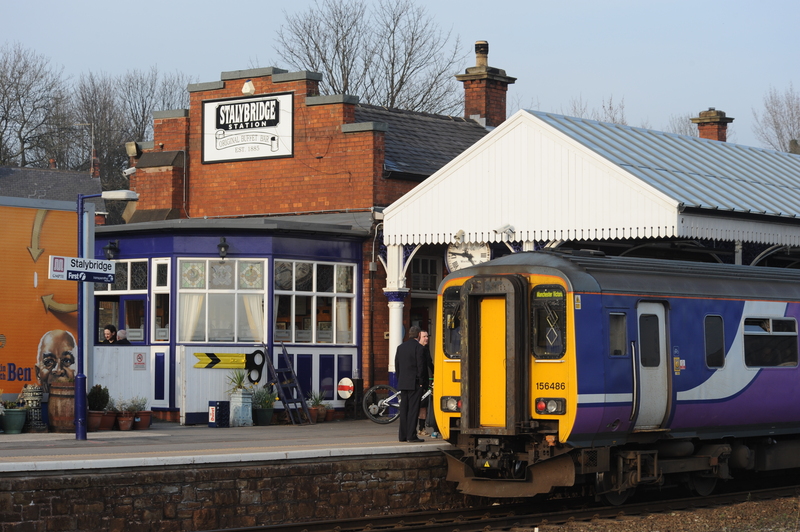 Anyone who has been a rail traveller since the 1970s will remember the BR era of station rationalisation when many stations lost all their fine buildings & facilities & had them replaced with draughty bus shelters, ugly brick bunkers – or nothing . Thankfully, that era is long gone & stations are enjoying a new age where they’re very much part of the community again. One great example of this is the rebirth & spread of the station buffet & bar. There’s a fantastic mixture of these places. Some are survivors from the past whilst many are brand new. There’s been a veritable explosion of food outlets on the railways in recent years, driven partly by the massive growth in passenger numbers & also by a new commercial focus within Network Rail. I should also mention the Railway Heritage Trust. They’ve been a great help by offering both advice & funding to some of these schemes. My nomadic lifestyle allows me to visit these places on a regular basis so here’s a sample of what’s on offer. These are some of my regular haunts & particular favourites. I’m always on the lookout for new places to visit so feel free to make any suggestions. Where I can I’ve provided links to the bars websites. 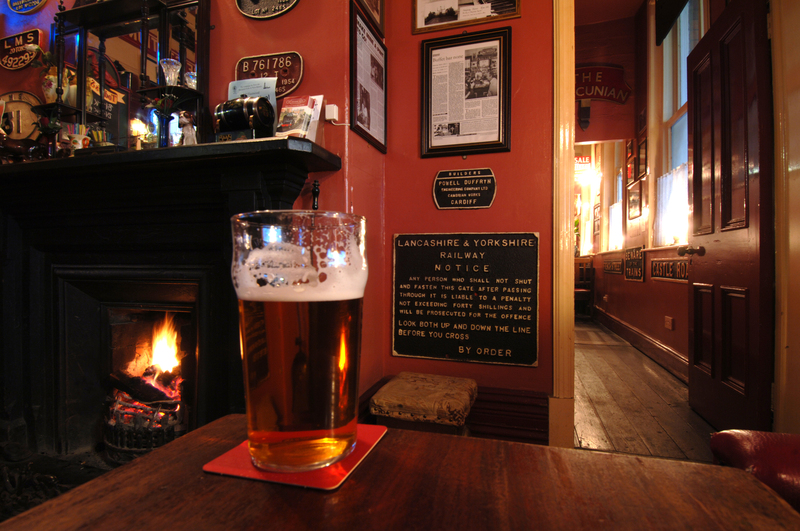 There’s nothing better on a cold winter’s day than a pint by a roaring fire as you’re waiting for pie & peas.. 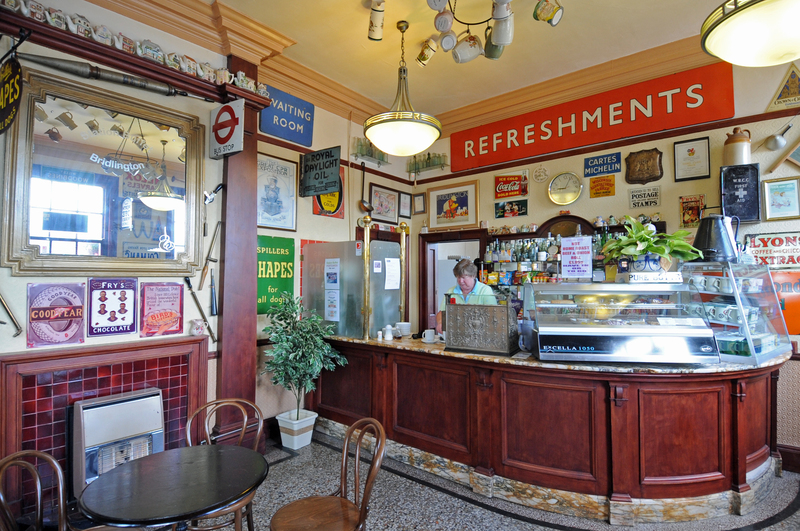 I couldn’t fail to mention the Jubilee refreshment rooms on my local station. 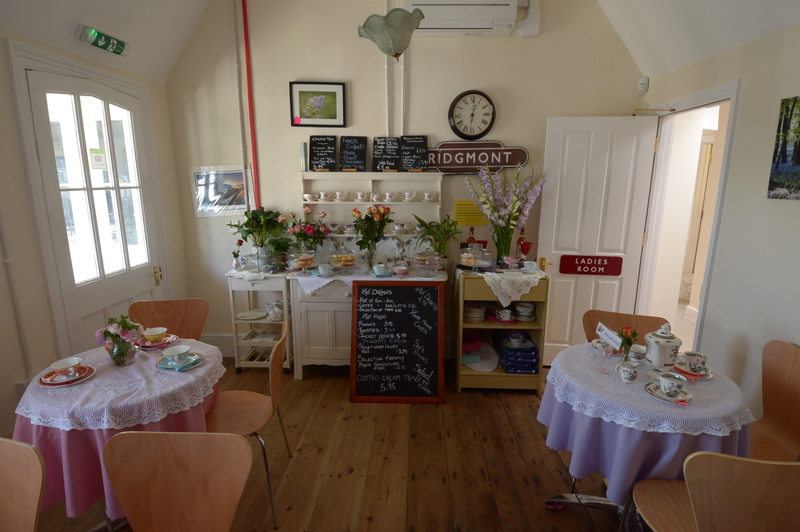 This award winning business was opened in 2009 by two local railway enthusiasts, Chris and Andrew Wright who secured the lease on the former waiting room & converted it into a lovely cafe-bar that’s become a real community focus. 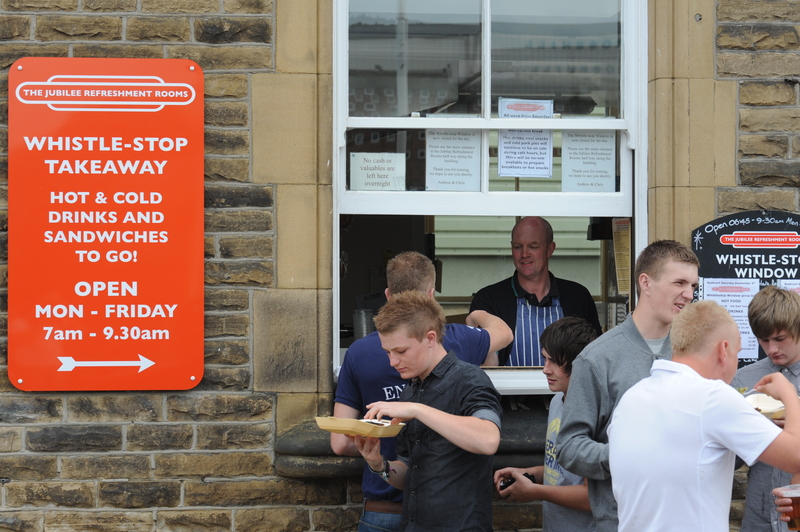 They hold a whole host of events, meetings & trips as well as being the base for the Friends of Sowerby Bridge station. In fact, I’m giving a photo show here in August (see their website for details)..
Chris Wright serves food from the ‘hatch’ during the annual rushbearing festival. The window is used to sell food & drink to hungry commuters every morning before the rooms open. Chris & Andrew are keen to let customers know how long the beers been on – hence these beer labels.. 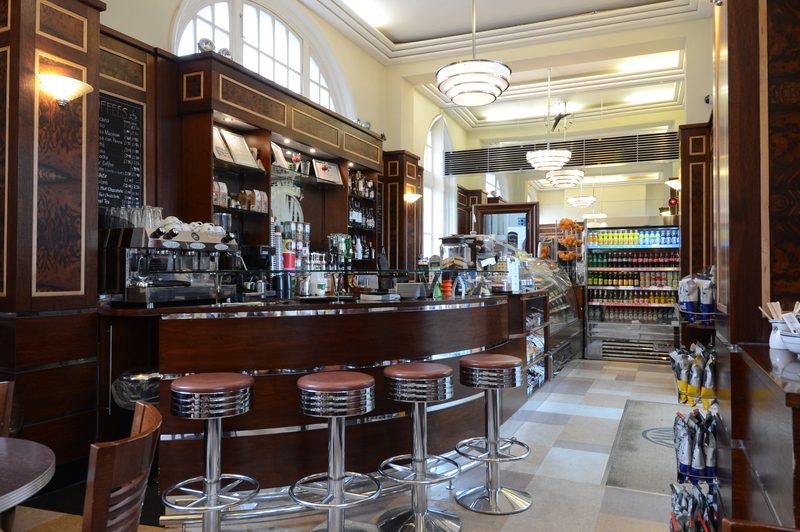 The Art Deco inspired interior of the Centenary Lounge at Moor St. 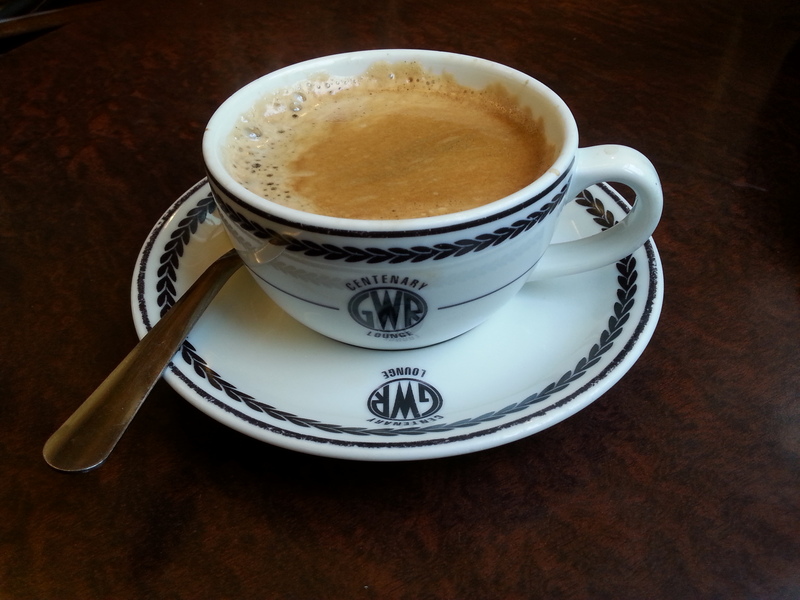 The Great Western feel is carried through to these delightful coffee cups. 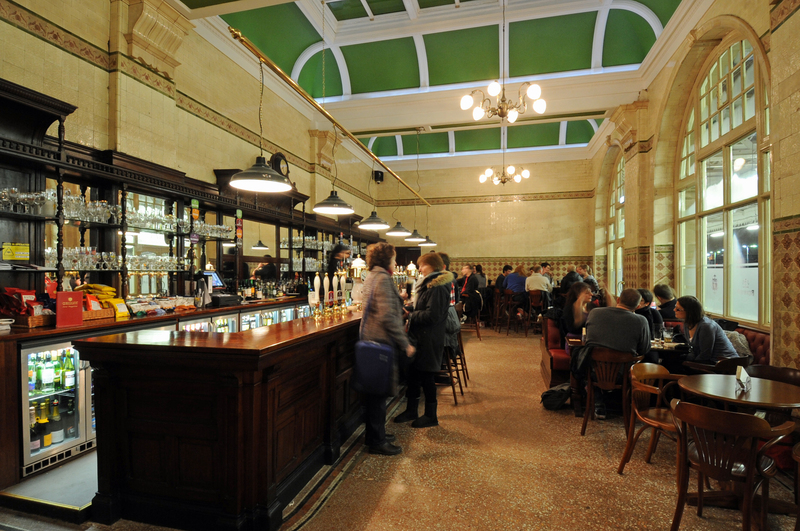 The Sheffield Tap is a superb example of a station bar that has been restored after decades of disuse & neglect. It really is a gem. 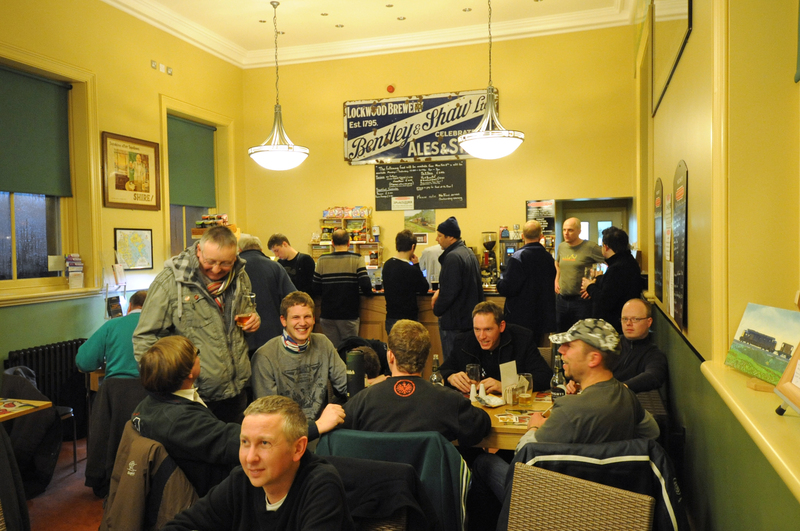 In 2008 friends Jamie Hawksworth & Jon Holdsworth began restoring the former Edwardian bar in the main station building with the help of a grant from the Railway Heritage Trust. The rooms had been vandalised & left to rot by BR, who finally locked up & abandoned them in 1976. The restoration of the Grade 2 listed rooms has been extensive & it’s a joy to behold. The place has been such a success that it’s extended from the original bar & taken over the former First Class dining room next door. This has allowed them to install a micro brewery on the premises. There’s always an impressive range of hand pulled real ales & bottled beers on sale, making the Tap a ‘must visit’ location for beer lovers. I love sitting here with a pint, admiring the quality of the restoration work whilst watching the trains go by outside. The pair have since gone on to open a splendid bar at York station as well as two bars at Euston, the Euston Tap & the Cider Tap – all are well worth a visit. What a gem! 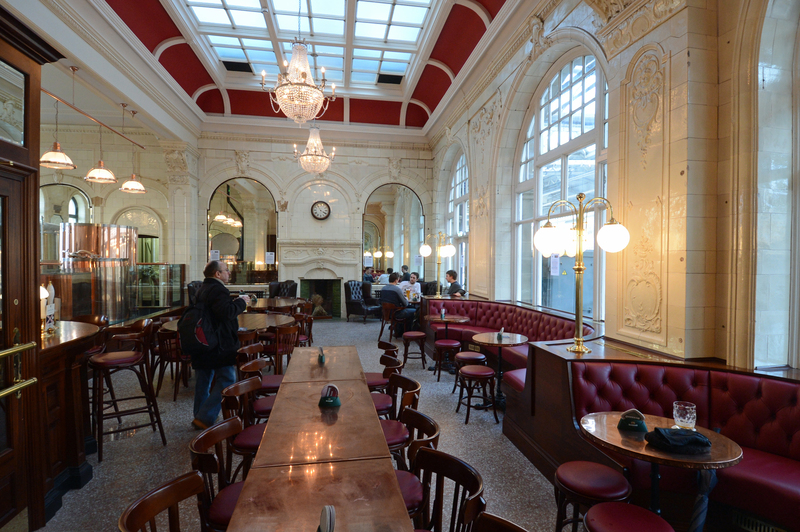 The refurbished bar, tiling & restored ceiling in the Sheffield Tap – back from the dead after years of deeliction. 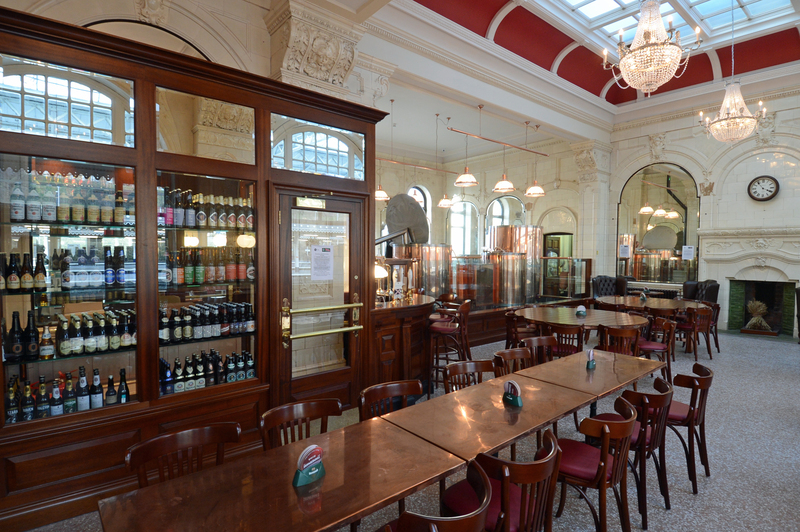 The gorgeous former First Class Dining Room has been reopened as the Tap extension, which housies the microbrewery. How’s this for a stylish place to enjoy a beer whilst waiting for a train? The former First Class dining room. 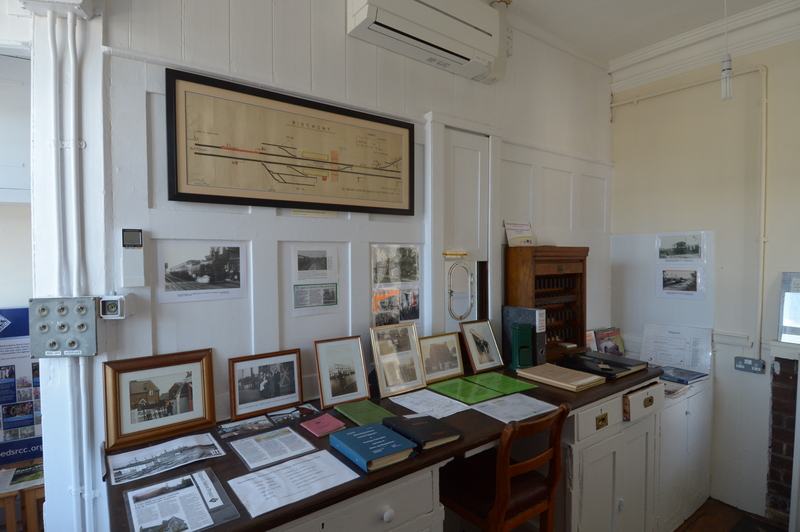 This little station building on the Bedford-Bletchley line has been leased from Network Rail and managed by Bedfordshire Rural Communities Charity. The project was instigated by Marston Vale Community Rail Partnership. 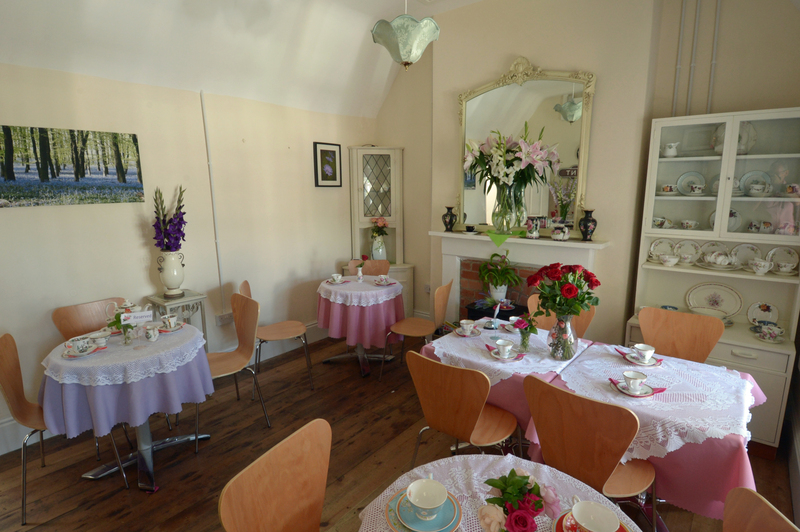 Having been derelict for many years the building underwent a 5 year restoration before reopening as a visitor centre & lovely little cafe in 2013. The building is staffed entirely by local volunteers. I visited in summer last year & was really impressed with the quality of the food, much of which (like the cakes) is made by the volunteers. 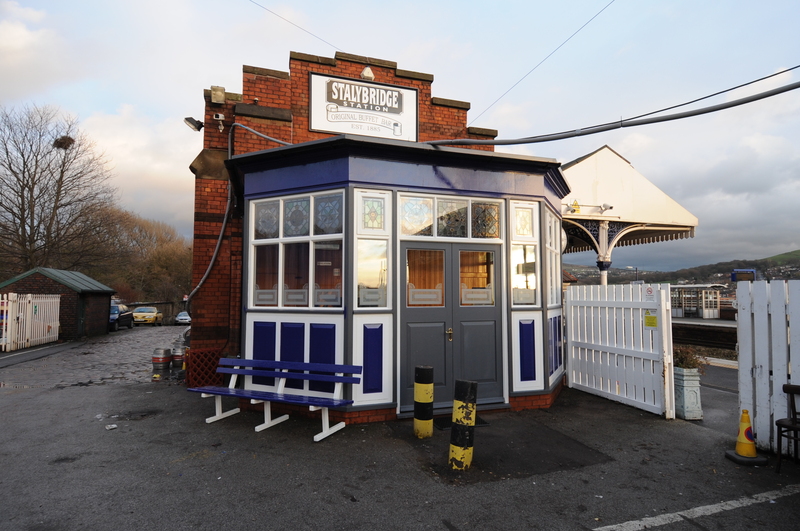 As well as the indoor cafe the station has an outdoor seating area. The project is a great example of a community coming together to bring back a station to life. 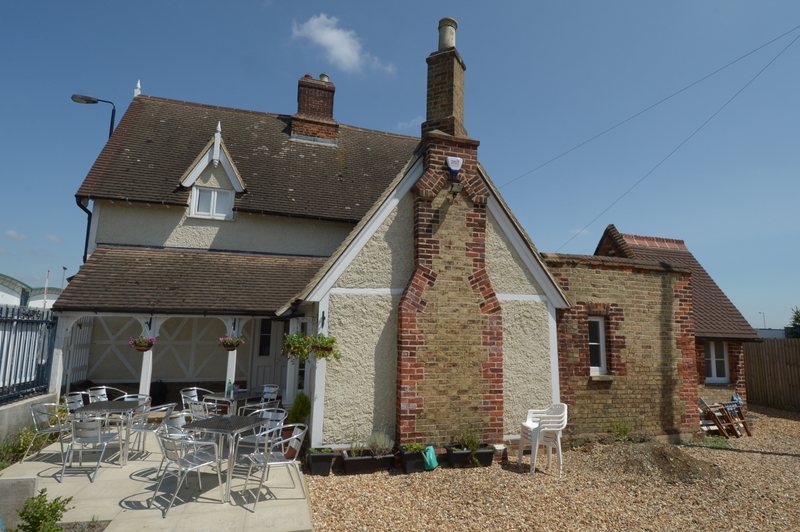 The outdoor seating area at Ridgmont is a real sun trap in the summer. 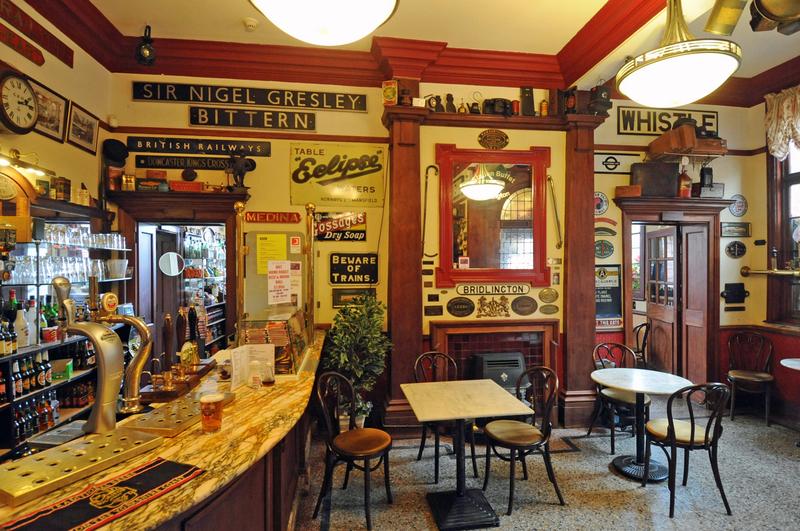 Another long-standing gem, this two room bar dates from 1912 & is still in use –although nowadays privately owned. 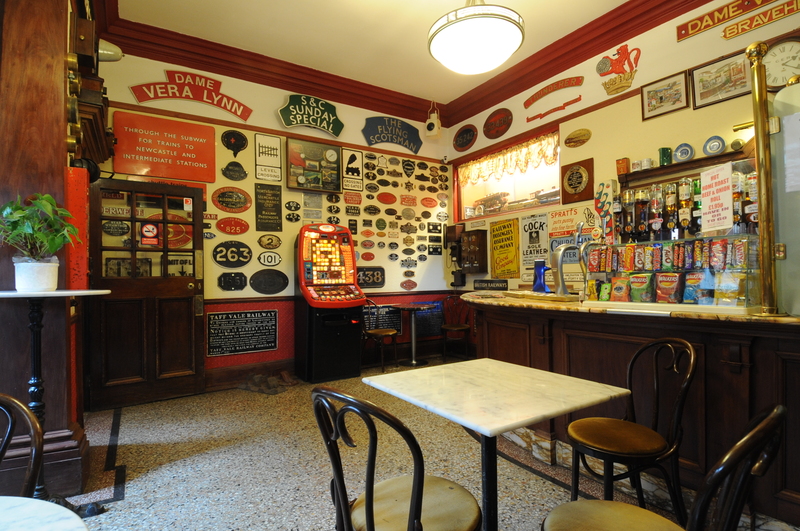 The bar retains its original mahogany fittings, marbled topped and terrazo floor, whilst the walls are full of various items of railwayana from all over the world. There’s also an outdoor seating area on the concourse, sheltered from the elements by the glazed roof. 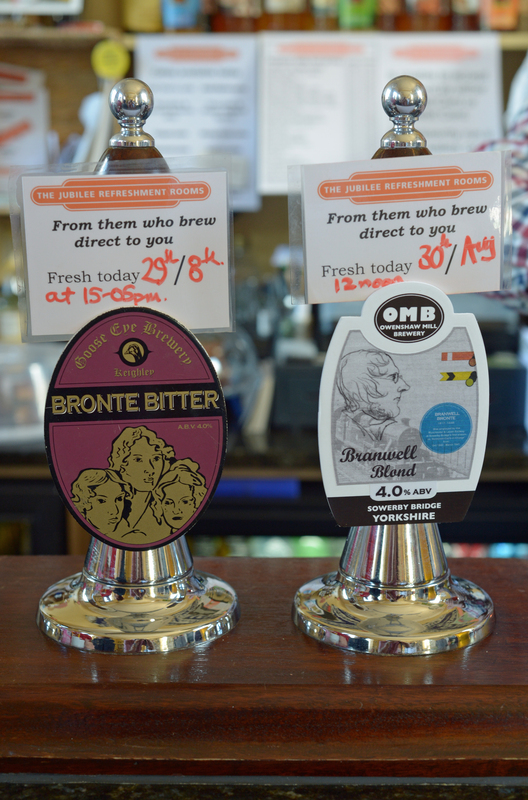 You can always find a good selection of real ales on sale, as well meals & snacks. 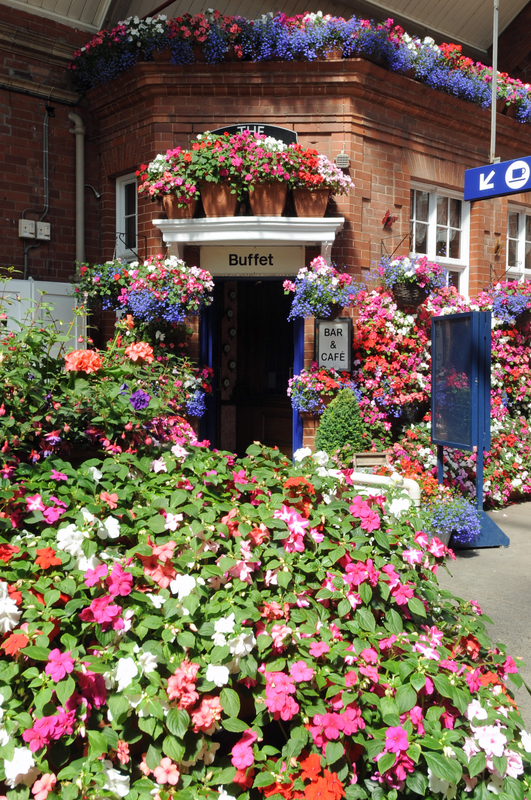 I really enjoy sitting outside herein the summer as the bar almost disappears behind a wall of flowers growing from the multitude of baskets & boxes adorning the walls. Another view of the bar looking towards the door out onto the concourse. The dining area & counter in the station bar. – I did mention that wall of flowers on the concourse!